In 2015, the Rockefeller Foundation-Lancet Commission published a report: Safeguarding Human Health in the Anthropocene Epoch.1 This report outlines the extent to which human activities have degraded the earth’s ecosystems such that basic life support services have become threatened. Among the threats are greenhouse gases and resulting climate change, severe weather patterns, deforestation, desertification, ocean acidification, zoonotic disease outbreaks, biodiversity loss and particulate air pollution. The report concludes that these planetary phenomena pose a serious and urgent threat to human health, well-being and sustainability, and calls for immediate attention to critical multidisciplinary research, and evidence-based policy formulation and timely implementation. Despite such widespread and growing acceptance, the One Health approach has been criticised for an excessive focus on emerging zoonotic diseases, inadequate incorporation of environmental concepts and expertise,18 and insufficient incorporation of social science and behavioural aspects of health and governance.19 20 Reviews of the burgeoning One Health literature have noted persistent scientific silos between human, animal and environmental sectors,21 the fact that many papers purporting to use a One Health approach actually consider only human and animal health (leaving out environmental health considerations),22 and that a need remains for additional proof-of-concept demonstrations on the added value of simultaneously considering human, animal and environmental health issues and outcomes in a One Health framework.23 24 To address such concerns, the recently published Checklist for One Health Epidemiological Reporting of Evidence,25 registered on the EQUATOR (Quality and Transparency in Health Research) network,26 encourages greater rigour and transparency in the reporting of One Health epidemiological research. How then does One Health relate to Planetary Health? 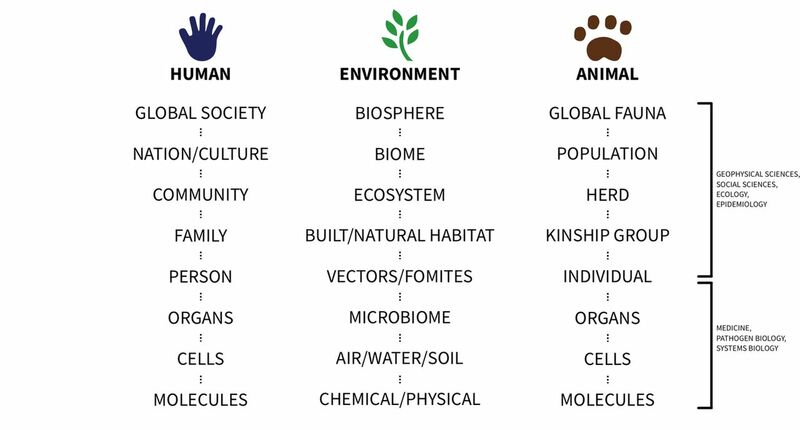 In a recent review, Lerner and Berg27 define One Health as a concept that values interdisciplinarity, public health, animal health and ecosystem health. The related concept of EcoHealth is seen as focusing, primarily, on biodiversity as well as participatory knowledge-to-action approaches. Planetary Health, by contrast, in Lerner and Berg’s27 opinion, has a more ‘anthropocentric’ perspective, viewing ecosystems (including animals as part of the biotic environment) largely in terms of their contribution to human health, well-being and sustainability. While the importance of emerging zoonotic diseases should be obvious to the readers of BMJ Global Health, we argue for further development of the One Health framework to better incorporate Planetary and EcoHealth concepts and the sense of urgency regarding environmental support systems. 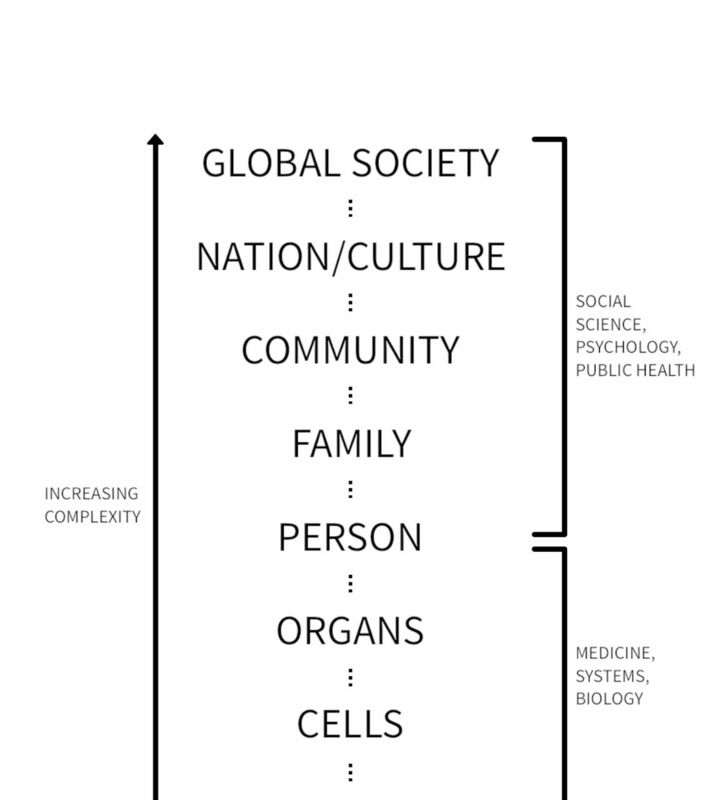 This expanded One Health framework builds on earlier systems approaches to human health, such as the biopsychosocial model of health proposed by Engel in the 1970s.28 In the biopsychosocial model (figure 1), human health is presented as a hierarchically organised system of increasing complexity, going from molecular interactions at the subcellular level, to tissues, organs and eventually individual humans. Many of these interactions on the lower end of the hierarchy, such as gene expression and medication effects, are the domain of systems biology and much of the practice of clinical medicine. The biopsychosocial model continues vertically towards levels of greater complexity, including interactions of humans in family groups, communities and larger societies. These more macroscopic interactions, and strategies to address population health at the community, national and global levels, relate more to the fields of public health, psychology and the social sciences, including economics and political science. 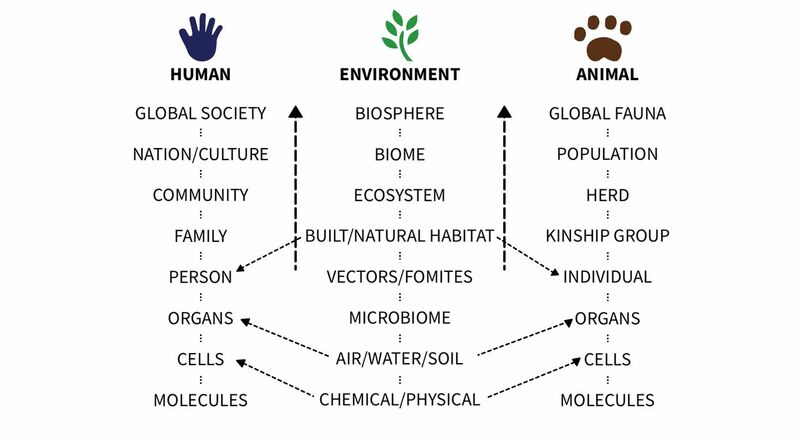 Our vision of One Health expands on this single hierarchical system of human health, to include simultaneously the three interconnected systems of humans, animals and the environment (figure 2). Like the biopsychosocial model, each system is organised vertically in levels of increasing complexity, from very simple molecular components up to complex systems of the global biosphere and the global populations of humans and animals. System levels for different types of One Health interactions. According to this framework, the One Health approach deals with the health-related interactions that occur between these systems at differing levels of complexity. Such interactions can take place at a molecular or cellular level: for example, the effect of environmental chemical exposures on cell receptors of humans or animals, or the exchange of antibiotic resistance genes between microbial communities of humans, animals or the environment. As with the biopsychosocial model for human health, many of these interactions can be described with systems biology or pathogen biology. Interactions can also occur at an individual level, such as the direct contact between a human and a companion animal in a household, and may require clinical interventions such as treatment of infection. At higher levels of interactions, such as community, national, regional and global population levels, other tools such as epidemiology, social and behavioural sciences, as well as atmospheric and geological sciences, and ‘big data’ expertise and approaches will be required. In this way, the One Health approach can ‘zoom out’ to address macrolevel or ‘planetary’-level interactions, such as the combined effect of growing human and animal populations on greenhouse gas emissions at the global/biospheric scale. One advantage of this expanded One Health framework is that it emphasises how interactions at clinical and local public health levels, such as emerging infectious diseases in individuals, households or communities, are connected to higher level, more complex threats to health and sustainability, including factors such as climate change, deforestation, and how they are impacted through land and water use, types of food production, human behaviours, poverty, equity and governance. As an example, characterisation of outbreaks of the zoonotic disease, Ebola, can be made at the individual level, where it is infecting humans, non-human primates and other animals. At this level, transmission events occur due to different types of contacts among and between humans and animals (eg, hunting, occupational, cultural practices, species-specific susceptibility and contaminated environmental sources). Addressing these problems involves knowledge of the viral transmission pathways and reducing contact between infected and susceptible individuals. At the more macroscopic level, however, the scope and severity of recent Ebola outbreaks may be related to deforestation, which is connected to local food insecurity and other uses of forests by expanding human and livestock populations, which are related in turn to cultural beliefs and practices, governance challenges and economic pressures. At a higher, national level, organisation of public health and economic systems affects education levels, access to healthcare and nutritious, affordable foods, and demographic trends including urbanisation and greater travel between villages and cities. These factors all have implications for agricultural systems and road building that affect the environment as well as both livestock and wildlife populations. Scaling up further involves consideration of regional changes in biodiversity and climate and the effect on bat reservoirs of the virus, and the effect of global travel patterns in moving the virus over large distances. In another scenario, a disease outbreak in an animal population, such as a sudden stranding of whales or other marine mammals, can capture the attention of the media and the public, raise questions on the causes of unexpected die-offs, and provide windows of opportunity for instituting needed, urgent solutions. While investigation of such events sometimes reveals a discrete proximate cause such as a viral infection or a toxic exposure, such a ‘sentinel event’ in animals may be an indicator of higher level environmental and human forces at play. Figure 3 shows how an animal sentinel event at an individual or group level can be mapped to larger, often planetary-level forces, resulting in improved articulation of research questions and more effective solutions. For example, accumulation of plastics found in the stomach of a stranded marine mammal may be a sign of wider contamination of marine environments by microplastics related to changes in the use of plastics in the textile industry.29 Widespread pollution by microplastics has considerable economic ramifications, including concerns about unsustainable manufacturing processes that could be affecting aquatic ecosystems, including fisheries important to the human food supply. Addressing this problem, therefore, may require major changes on the part of manufacturers and consumers, involving national and international policy initiatives. How sentinel events in animals and humans can provide warning of health threats at higher global and planetary levels. In another example, the outbreak of mercury poisoning among fish-eating residents of Minamata, Japan, due to contamination in local fish from the polluted bay30 was preceded by die-offs of fish and neurological disease events in cats and other animals. The event also showed the health danger of unregulated industrial manufacturing and widespread chemical pollution of the environment. The One Health framework can be used not just to identify and control health threats, but also to identify positive models for healthy coexistence, well-being and sustainability of these interconnected systems. For example, a farm with animals, if managed using One Health principles that optimise the health and well-being of the humans (farm workers, farm families, community members and consumers) as well as the animals and the local environment (protecting forests and water supplies, reducing energy consumption, using renewable energy, and eliminating air and chemical pollution) can provide a model that, if replicated on a wider scale, could help mitigate the environmental consequences of agricultural food production. Assessing the sustainability of different types of farming practices in a One Health way requires skills of modelling and integration of human, animal and environmental outcomes on a larger scale, considering aspects such as carbon footprint and life-cycle assessment. A recent European consensus statement described the key aspects of the One Health concept as interspecies equity (valuing animal health and well-being simultaneously with humans), stewardship and resilience.31 Yet why should the global health community concern itself with animal health issues? It could be argued that, given the urgency of environmental degradation described in the Planetary Health report, higher priority should go to actions that focus on the survival of humans. In this worldview, animals are viewed as part of the life-supporting environment, contributing to the rich and complex biodiversity of ecosystems (necessary for the survival, well-being and health of humans and other species) and providing nutrition for human populations (at the pinnacle of the food chain). Yet there are important reasons to apply instead a One Health framework that places intrinsic value on considering the health and well-being of animals separate from environmental considerations. Lastly, the human affection and attachment to animals that has evolved over thousands of years is also likely to continue, and can be a critical leverage point in finding ways to promote policy, family and individual actions to protect the ecosystems we depend on for life. For example, the Planetary Health report mentions the paradox of certain global burden of disease indicators currently improving despite the many warning signs of environmental degradation. By contrast, the increase in animal disease outbreaks and species extinctions, clearly with important environmental change drivers, may be easier for the public to connect with. This could help drive support for policy change. We encourage discussion and further development of this planetary One Health approach, and BMJ Global Health welcomes submissions based on the planetary One Health approach. Adopting the planetary vision for One Health will help to better connect ongoing global health efforts in disease control and preparedness to larger underlying and pressing issues of environmental change, equity and sustainability. Creating local models of healthy coexistence between humans and animal populations and the environments they share and depend on for life is critical for ensuring a sustainable future for our shared home of planet earth. The authors would like to thank Mr. Joshua Steele for graphic design. Wellcome Trust, 2018. Priority area: Our Planet, Our Health—responding to a changing world. Available from: https://wellcome.ac.uk/what-we-do/our-work/our-planet-our-health [accessed 19 Jul 2018].
. Ecosystem sustainability and health. Cambridge University Press, 2004. ISBN: 0-521-53185-3. FAO, OIE, WHO. The FAO-OIE-WHO Collaboration: sharing responsibilities and coordinating global activities to address health risks at the animal-human-ecosystems interfaces. A Tripartite Concept Note April 2010. Available from: http://www.who.int/foodsafety/zoonoses/final_concept_note_Hanoi.pdf [Accessed 19 Jul 2018]. American Public Health Association, November 2017. Advancing a ‘One Health’ approach to promote health at the human-animal-environment interface. Policy Number: 201712. Available from: https://www.apha.org/policies-and-advocacy/public-health-policy-statements/policy-database/2018/01/18/advancing-a-one-health-approach [accessed 19 Jul 2018]. , 2018. One health European Joint Programme. Available from: https://onehealthejp.eu/ [accessed 19 Jul]. CDC Global Health Security Agenda (GHSA), 2018. Implementing the Global Health Security Agenda: progress and impact from U.S. Government investments. Available from: https://www.ghsagenda.org/docs/default-source/default-document-library/global-health-security-agenda-2017-progress-and-impact-from-u-s-investments.pdf [accessed 19 Jul 2018]. Global Risk Forum Davos, 2012. One Health – An integrative health risk management perspective. Available from: http://onehealth.grforum.org/about/about-one-health/ [accessed 19 Jul 2018].
. One health: science, politics and zoonotic disease in Africa. Routledge, 2016. Equator Network. Enhancing the quality and transparency of health research. Available from: http://www.equator-network.org/reporting-guidelines/cohere/ [accessed 19 Jul 2018].
. Human and animal sentinels for shared health risks. Vet Ital 2009;45:23–4.
. A Blueprint to evaluate one health. Front public health. Front Public Health 2017;5.